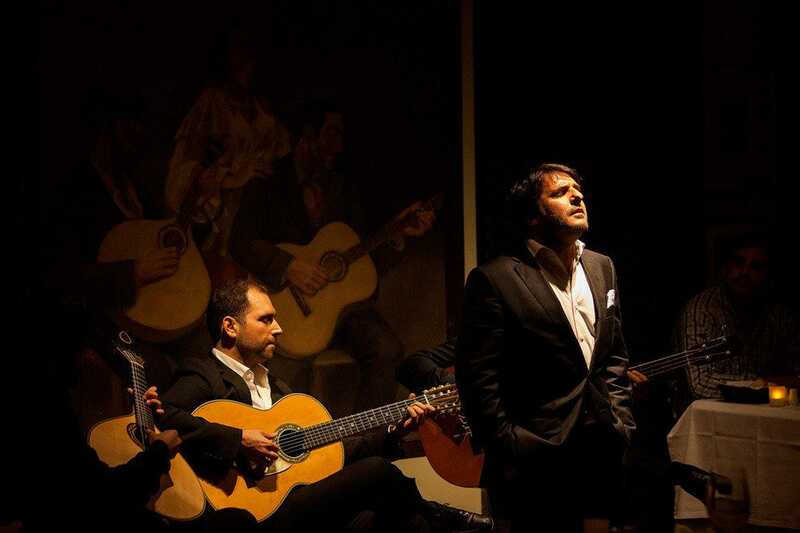 Fado, Lisbon’s mournful yet beguiling musical expression is an integral part of Portuguese culture, and is included on UNESCO’s Representative List of the Intangible Cultural Heritage of Humanity. Listening to the haunting strains of this unique musical style, a combination of soulful voice and melodic guitars, should be on every visitor’s list of things to do in Lisbon. Fortunately there lots of restaurants, or fado houses, that host performances of this poignant music. 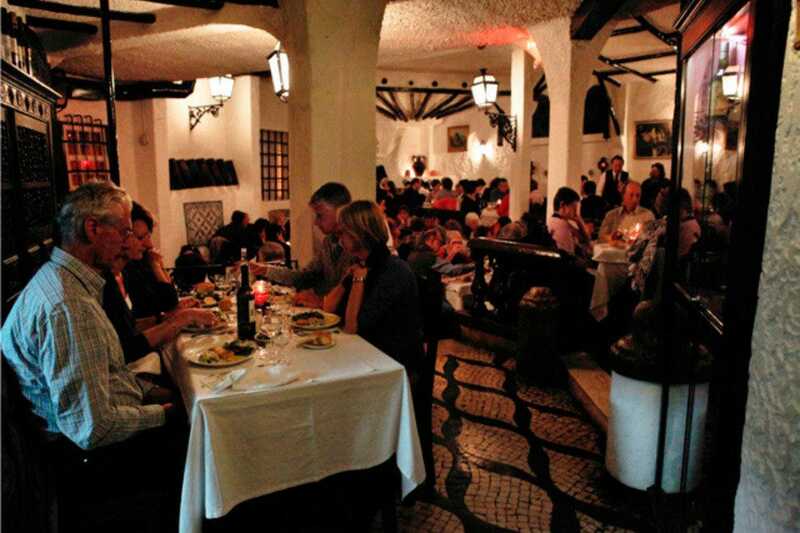 Among the most celebrated is O Faia in Bairro Alto, a particularly attractive restaurant. 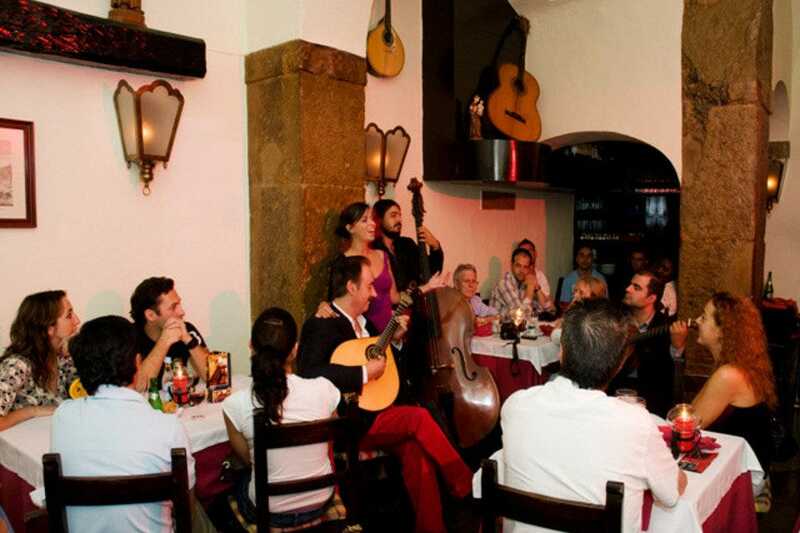 Another famous venue is Casa de Linhares in Alfama, which in fact shares the spotlight with nearby Clube de Fado, an equally revered fado house. For a special treat head across town to Senhor Vinho, located in Lisbon’s exclusive Lapa neighbourhood. The oldest family-run fado house is A Severa, whose reputation is acknowledged across the city. 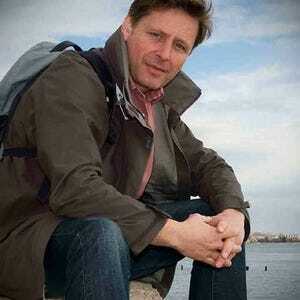 The list of fado restaurants is certainly heightened by the well-respected Adega Machado in Bairro Alto. Noted for its genuine atmosphere is Timpanas, situated in the city’s Alcantâra district. 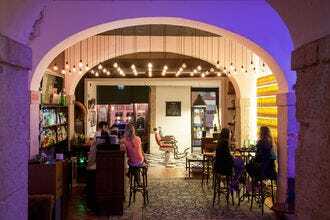 For a less informal experience, arrive early at A Baîuca in Alfama to experience fado vadio, the wonderfully domestic amateur version of fado. Alfama is also home to the famous Parreirinha de Alfama. And if you’re part of a large group, you’ll probably end up at the ubiquitous Café Luso, a popular restaurant located back in Bairro Alto. Founded in 1927, this prestigious venue is inexorably linked with the history of fado â" the late lamented Amalia Rodrigues sang here, among other great names. 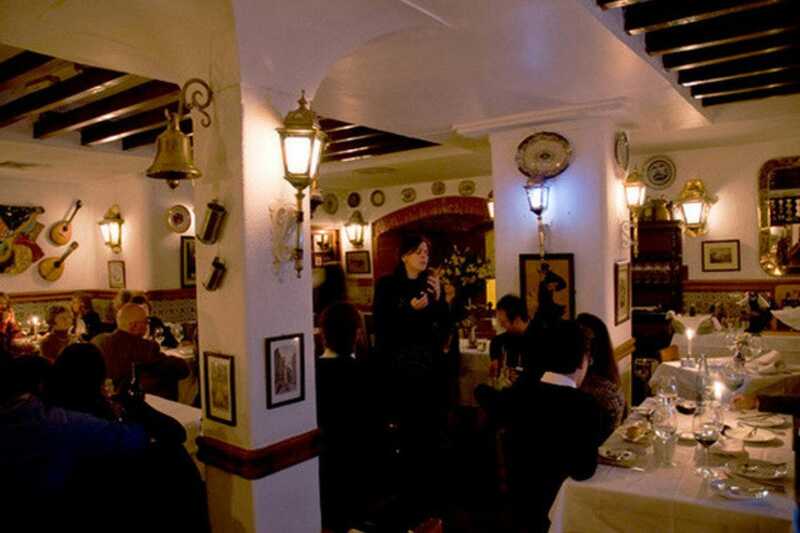 The restaurant is one of the most impressive of all Lisbon's fado houses and in fact is fashioned out of the old cellars and stables of a former 17th-century palace. The vaulted ceiling provides unique acoustics. 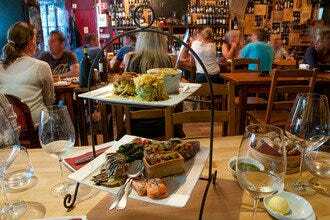 It's location in the heart of Bairro Alto means that Cafe Luso is a favourite on the tour group itinerary, and at times the place can get too busy. The menu offers traditional Portuguese cuisine alongside a good selection of national wines, and diners are treated to beautiful renditions of fado, and displays of regional folk dancing. Running for over 50 years, this is one of Lisbon's oldest fado houses. A firm favourite with locals, many of whom have grown up with the redoubtable Argentina Santos, the fadista who owns and runs the restaurant and who often takes to the floor to sing, Parreirinha de Alfama also attracts its fair share of tourists. The venue is cosy and intimate and the atmosphere very authentic. The rustic interior design has changed little over the years, and the beautiful azulejos (tiles) decorating the walls still gleam brightly. 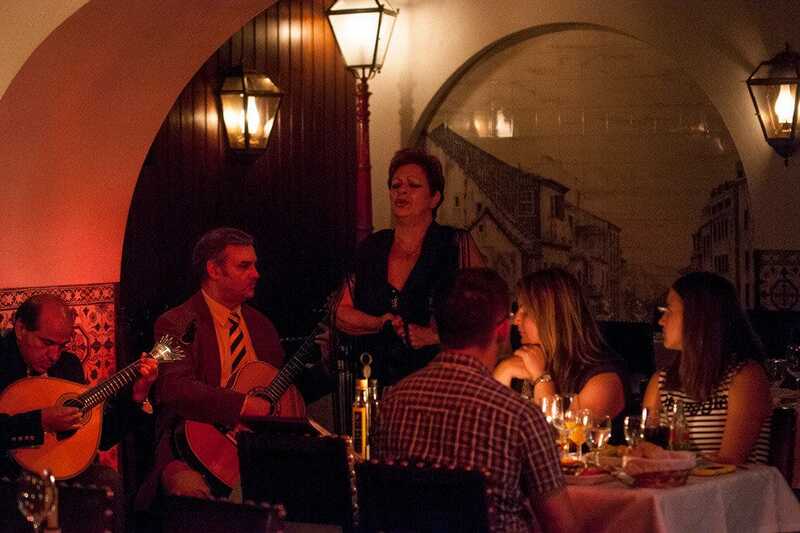 Besides Argentina, resident singers include Lina Maria Alves, Tina Santos and Luis Tomar who regale customers between hearty servings of traditional Portuguese fare. Incidentally, Argentina also cooks and a speciality of the house is arroz de tamboril (monkfish rice). 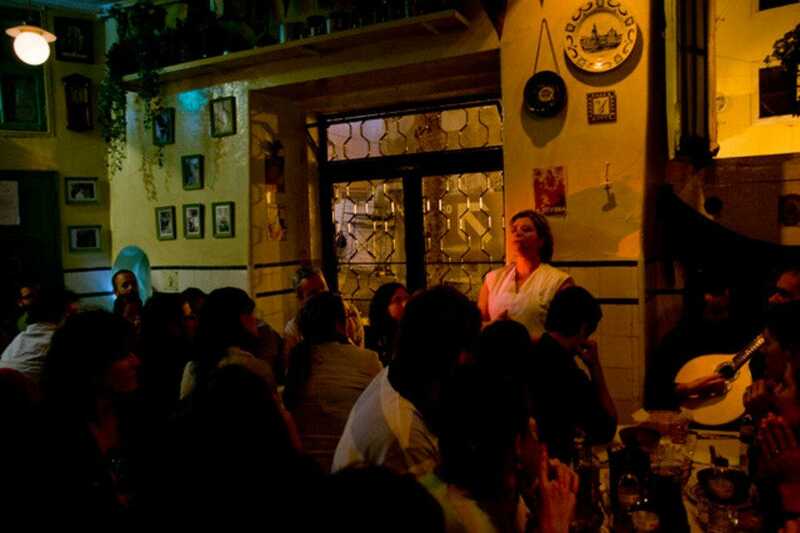 Established since the 1960s, this is one of Lisbon's most famous fado houses and features resident singers Celeste Maria, Isabel Pinheiro and Helder Santos, plus a host of well-known guest artists. Interestingly, the restaurant also stages folklore shows, when dancers in traditional costume warm up the audience with colourful and rhythmic set pieces. Guests can enjoy a dinner of authentic Portuguese cuisine based on regional recipes, especially those from the north of Portugal (the chef is from Trás-os-Montes, way up in the mountains). A superb selection of noted wines accompany the dishes. 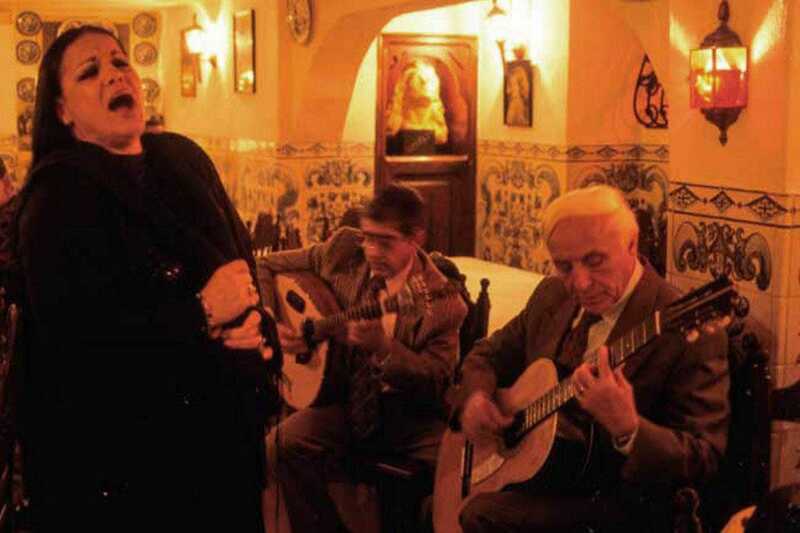 The fado itself is first class and attracts a loyal clientele as well as tourists from around the world. The façade of this historic fado house is distinguished by a stunning vintage azulejo (tile) design fashioned around the front door of the premises. The tiles depict guitars, dancing folk singers and jugs of wine and date from 1937, when the restaurant opened. A careful refurbishment in 2012 has transformed the interior into a striking and contemporary dining space the walls of which display various paintings, drawings and photographs belonging to the Machado family. The greatest exponent of fado, Amália Rodrigues, sang here. More recently, her modern counterpart Mariza has graced the floor. Resident singers today are: Marco Rodrigues, Isabel Noronha, Pedro Moutinho and Joana Veiga. The cuisine is traditional Portuguese but served with modern flourishes. The wine cellar is stocked with reds and whites from across Portugal. 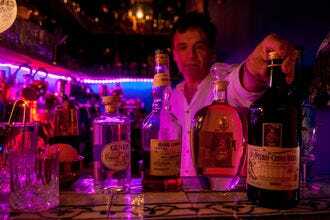 The same family have run this highly respected fado house since 1955, which makes A Severa quite unique. The original owners, Maria José and Júlio Barros Evangelista, named their restaurant after Maria Severa, a 19th-century gypsy singer who was one of the most famous fadistas of her time. Decorated with dark wood furnishings and azulejos panels depicting Lisbon scenes, A Severa's rustic atmosphere is heightened by a wood-beamed ceiling. The menu celebrates the very best of Portuguese cuisine, a choice complemented by an inspired wine list. The music, a unique blend of melody and melancholy, is performed at intervals under dimmed lighting â" a wonderfully intimate experience. Over the years A Severa has attracted its fair share of VIP guests including in the 1970s US President Richard Nixon. Now in its third generation, the restaurant maintains a low profile despite its status as one of the most noted fado houses in the city â" a fact Maria and Júlio would surely appreciate. This smart, rustically decorated venue is ticked away in Lapa, one of the city's most exclusive enclaves. As such, customers tend to hail from the world of politics and the arts, and prices are a little steeper than elsewhere. But it's worth the extra pennies. The gastronomy is first class and represents Portugal's finest culinary traditions with hearty and aromatic dishes such as the veal stew and a wonderful baked fish and pineapple gracing the menu. The wine list is a revelation and the desserts sublime! As for the singing, it doesn't get much better: the restaurant's esteemed roll call of artists include Maria da Fe, Aldina Duarte, Francisco Salvacao Barreto and Joana Amendoeira. 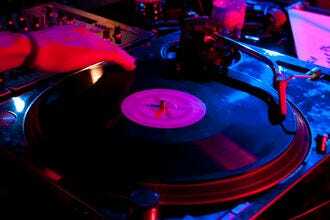 Senhor Vinho is particularly geared towards groups so advance booking is advised. Mario Pacheco, an accomplished guitarist who's played with the best of them, including Camane, Ana Sofia Varela and Mariza, owns this beautiful and revered establishment. 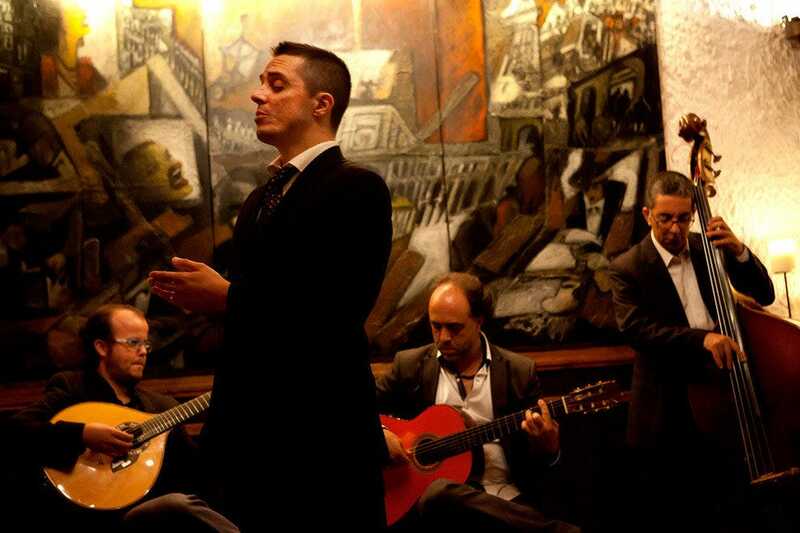 The club is one of the best venues in Lisbon to hear professional fado, and over the years has attracted Portugal's most celebrated fadistas. The building is centuries old. 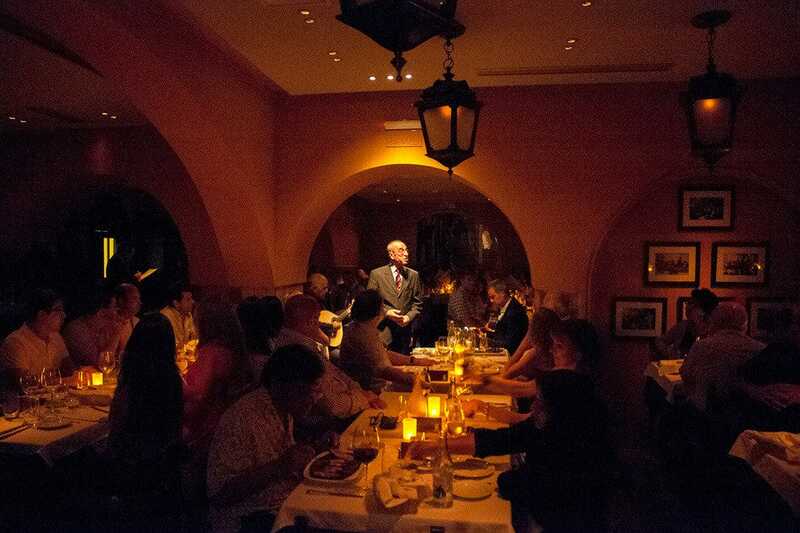 Guests dine under a vaulted ceiling of brick stone, and in one corner of the room an original Moorish well still stands. Between courses diners are regaled to the haunting strains of Portugal's most emblematic musical style, delivered by male and female singers, depending on the programme. 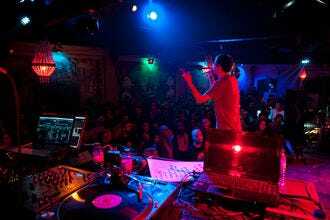 The club's reputation is such that along with portraits of the performers there are dozens of photographs decorating the walls of VIP guests shaking hands with a proud Mario. Set over the historic foundations of a manor house that was once the residence of the Counts of Linhares, a Renaissance landmark before it was destroyed by the great earthquake of 1755, this popular fado house attracts some of the city's best singers and musicians. Michelin notes the restaurant, Bacalhau de Molho, for its impressive menu of regional Portuguese cuisine. Typical of the choice is the succulent cod, a traditional fish dish garnished with potato and gardens vegetables, and a signature plate of awarding-winning chefs Samuel Mota and Ivo Brandão. Among the regular performers at Casa de Linhares are Jorge Fernando, Vânia Duarte, Silvana Peres, Fábia Rebordão and André Baptista, accompanied by young guitarists Bruno Chaveiro and André Dias. 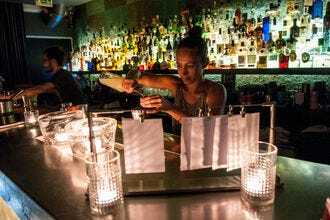 O Faia began life as a small bar back in 1947 when founder Lucillia do Carmo together with her son Carlos opened the Casa de Fados in Lisbon's Bairro Alto neighbourhood. One of the city's most respected fado houses, the smart interior exudes a mellow rustic character that is immediately warm and inviting. Chef Carlos Abreu and his team have created an imaginative à la carte menu of traditional Portuguese fare as well as the simplified but equally delicious Menu Bairro Alto. The excellent wine list is representative of some of Portugal's most celebrated wine growing regions. Between courses the lights are dimmed and guests are regaled with the haunting and evocative strains of fado. Among the resident singers are Lenita Gentil and Ricardo Ribeiro, ably accompanied by Fernando Silva on Portuguese guitar and Paulo Ramos, who plays classical guitar.